The largest deal in the fourth quarter of last year was Regus signing for 76,000 sq ft at refurbished The Crossway, Great Charles Street. Regus also signed for 33,000 sq ft at The Lewis Building during the final quarter. With sustained office demand, Savills expect take-up to reach 825,000 sq ft in the city centre during 2018 and forecasts top rents to reach £34 per sq ft by end 2018. Office investment in Birmingham reached £462 million during 2017, 16 percent above the previous 10-year annual average (see Graph 4). Overseas investment acquired £288 million and accounted for 62 percent of the total investment last year. 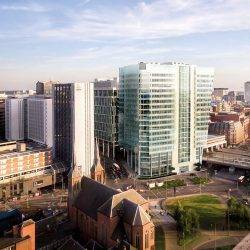 This was largely driven by the £265 million acquisition of 3,4,5,6 & 9 Brindleyplace during the first quarter. Prime office yields remain at 4.75 percent, in line with the prime regional average. In an income driven environment, prime yields remain attractive against West End (3.25 percent) and City offices (4 percent). Savills expect yields to hold firm throughout the first half of 2018 as overseas investors become increasingly open to looking outside London to the regional cities.